Justin Verlander didn’t have a Justin Verlander year, you may have noticed. Sure, he had 200 strikeouts and a decent ERA, but he wasn’t the guy that won all of the hardware in 2011 and could’ve won more in 2012. But that was because he had to work something out mechanically. Verlander has talked about this before. 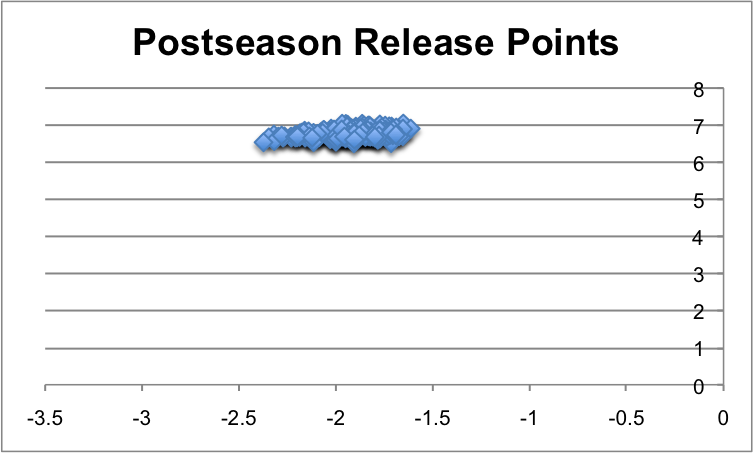 In fact, we checked in on his release points in early September ($), and we found it was different from years past. 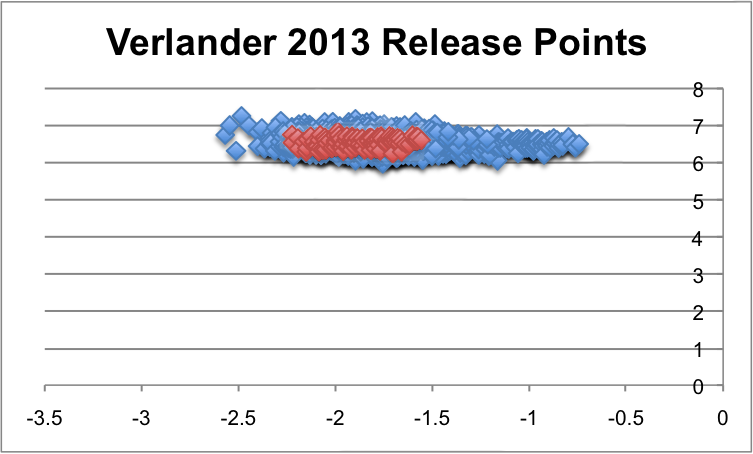 See his 2012 release points up first, and then below you’ll find his 2013 release points. In red is his start on September first. 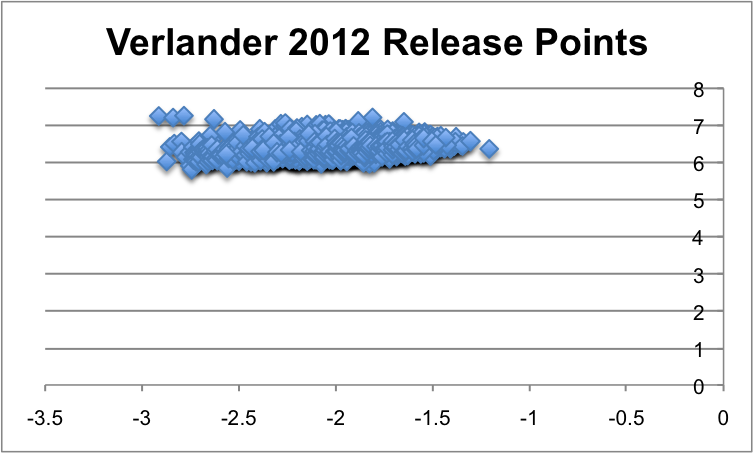 There were signs that Verlander was figuring things out with respect to his release point in that first September start. And he went on to have a much more Verlander-ish September. A 2.27 ERA and three shutouts might be enough of an argument for some, but the last two starts (22 strikeouts against four walks in 12 innings) were against the Twins and Marlins, who were second-to-last and last in their respective leagues when it came to scoring runs. That’s okay, the peripherals were legit all month. He struck out nearly a third of the batters he saw (30.6%) and got his walk rate down past his career level (7.4% career, 6.4% in September). His average fastball velocity jumped from 93.7 mph to 94.8 mph. Which brings us to the postseason, and his two starts in this series. He’s pushed his average fastball velocity a bit more, to 95.3 mph. He’s given up six hits and two walks, with 21 strikeouts in fifteen innings so far. How are his release points looking? You might even say that his release points have traveled further towards his 2012 values. They’re certainly not out in the -1 territory where he found himself in the early goings this year. The postseason isn’t the time for lengthy interviews on what exactly the mechanical change was. It’s not even really the time to make these sorts of adjustments. So it works out swell that Verlander found what he was looking for in September. After “knowing from jump street that things weren’t right this year,” the ace “battled” and made “end-game, and mid-game adjustments, throwing multiple bullpens.” The work came to fruition against a great Oakland team on Thursday night, when by shoving eight innings of one hit ball, Justin Verlander brought his Tigers to the brink of the ALCS. We hoped you liked reading Verlander Gets His Mechanics Fixed Just In Time by Eno Sarris! Never mind, I can’t read. 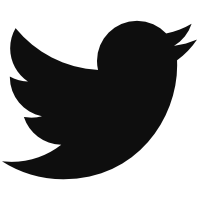 Ignore me!